Try Continuous Ink System with your Brother MFC-790CW and make 30 times more quality prints for the same money! Pay only 0.04 USD for A-4 full color print! Ink System for Brother mfc-790cw: Quality and savings in one case! CISS is an abbreviated name of the continuous ink supply system. The usage of this system is the way to make great savings on printing. The expenses on printing with ciss brother mfc-790cw will be reduced by 10 times at least. For some models of printing devices the usage of the continuous ink supply system increases savings up to 50 times! What for do you need such a system? Every time, when your cartridge runs out of ink, you have to spend money for buying a new original set. Its price is about 30-60% of the cost of the printer itself. By installing ciss mfc-790cw you can forget about such expenses forever. All you need is to buy or to make cis brother mfc-790cw, or the similar models ciss for brother mfc-295cn and ciss for brother mfc-j410w for your printer model or ink. If you purchase ink apart from the cartridge, it will cost cheaper. After the installation of this system, you will not be troubled with purchasing of a new set of cartridges or with their refilling. The volume of ink bottles exceeds the volume of cartridge by 5-15 times that is why you can use it for a long period. Even if you run out of ink, you just will have to change the ink bottles and your device will be ready to print again. You will have no fuss with syringes, chip resetting and other actions as for refilling original and refillable cartridges anymore. It's reasonable to use the continuous ink supply system with inkjet printers, which have built-in printing head (there are printers without printing head in the printer case, it is situated on the cartridge). It is related to the fact, that the resource of built-in printing head is larger. The most widespread printers with built-in printing head are Brother printers. 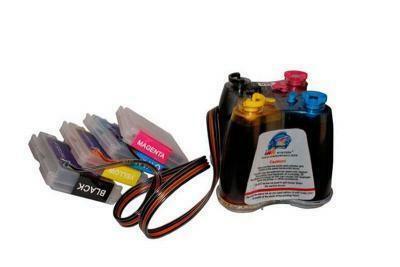 The continuous ink supply systems (CISS) can be used with all the inkjet printers. They allow to make savings on printing by more, than 50 times, in comparison to the usage of original cartridges, and by 30 times in comparison to the usage of alternative ones. By using ciss ink system brother mfc-790cw at home, you will save your money and time on printing photos and any color production. For example, the photos of 10x15 cm format will cost you 10 coins! Now the cost of printing with CISS is lower than the cost of printing with laser printer. CISS for mfc-790cw for your business means a new possibility to give additional services. The color copying, instantaneous printing from any digital mediums, printing of photos, posters and other advertising materials, all these became profitable due to the usage of the ink supply system ciss for brother mfc-790cw.